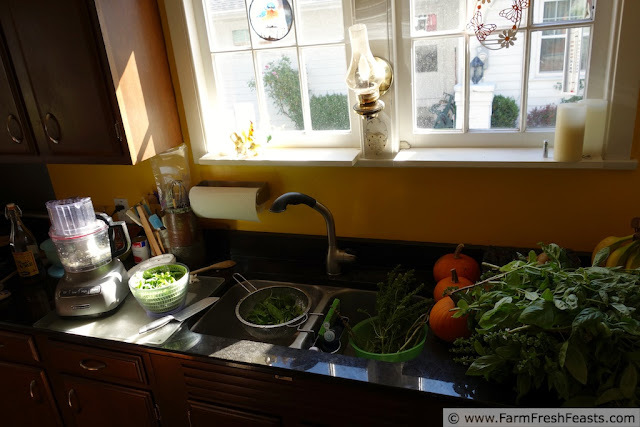 Farm Fresh Feasts: Processing a Pile of Pesto before the Frost comes! Processing a Pile of Pesto before the Frost comes! 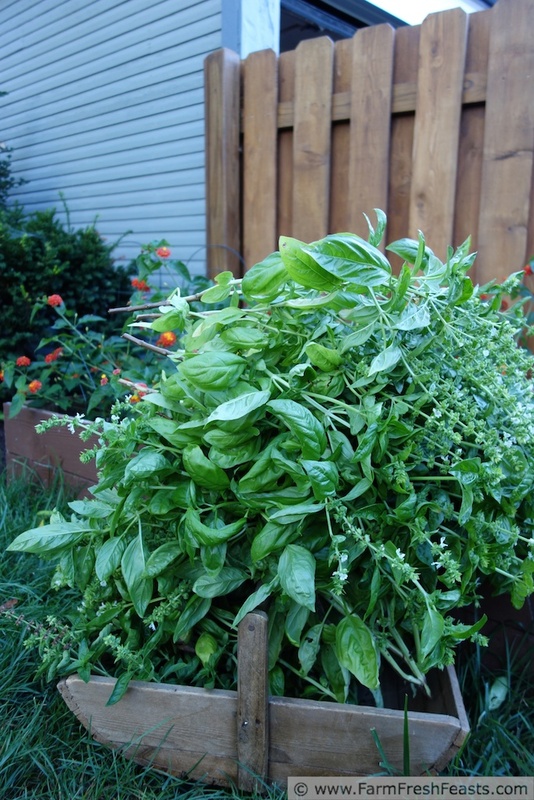 A tutorial for how to put up a large quantity of basil pesto. Remember this at the end of summer! Forty-one degrees out this morning-not expecting that! I figured I'd better harvest all the basil and put it up before it gets OBE (overcome by events). Here's what I did. 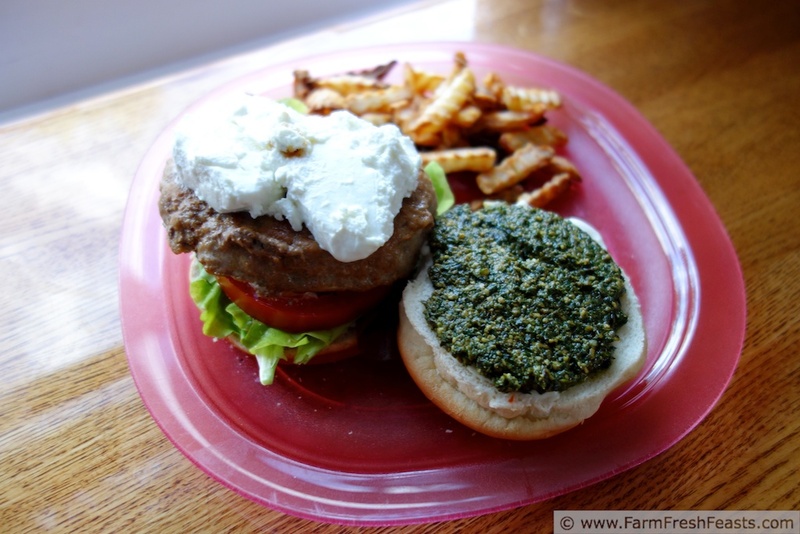 To me, pesto is all about ratios. If you have a ton of leaves, you will need 1/8 ton of toasted pine nuts, 1/4 ton of shredded parmesan cheese, 1/4 ton of olive oil. Oh, and 2 cloves of garlic and 1/4 teaspoon of salt. Ish. Even if this harvest is short of a ton, it's still a lot of leaves to get through. I buy pine nuts and parmesan during the basil season just so I don't get caught short when I'm ready to make pesto. Forgot the garlic. Again. And salt. 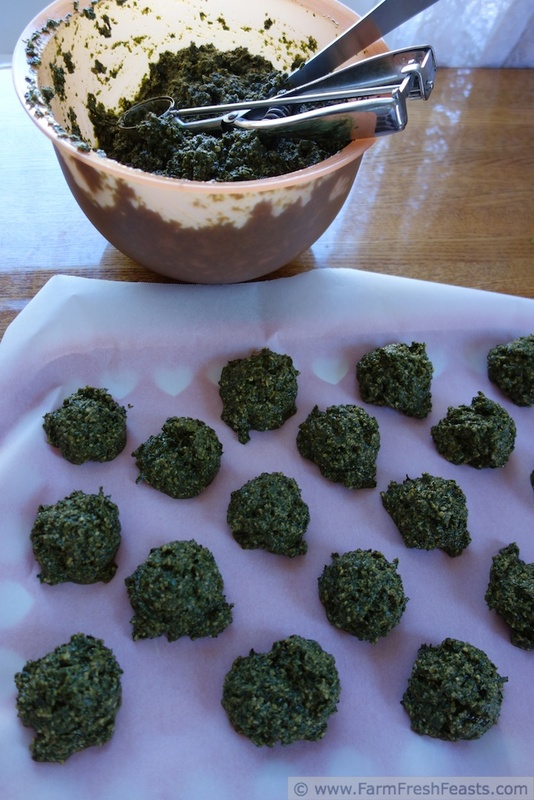 For other recipes using mass quantities of herbs, please see my Herb Recipes Collection. It's part of the Visual Recipe Index by Ingredient. Wanna know how to Use This Blog? Click here. I start by toasting pine nuts in a dry skillet, about 3-5 minutes on low-medium heat until they are fragrant but not burnt. I used a whole big bag (8 oz) because I knew I'd do a huge batch. I have a lovely food processor given to me this past Mother's day. The first time I used it to make pesto, I realized that all the chefs who tell you to turn on the processor and drizzle the olive oil in while the blades are whirring are right! Who knew?! First thing I do with the food processor is shred the parmesan cheese using the fine shred disc. I set aside the cheese but don't bother to clean the processor bowl. Since I know my bowl will hold a double batch of pesto, I smash and peel 3-4 cloves of garlic. Put the skins in the soup pack in the freezer! Finely chop the garlic with the chopping blade. Then I get the assembly line of basil going. First, I pluck the leaves off the stems until I fill the colander. It's zen-like, but stains your fingernails. Then, I rinse the leaves, spin them dry, and add 4 large handfuls (about 4 cups packed) to the garlic in the processor bowl. After I've pulsed that a bit, I add the toasted pine nuts and pulse some more. Then I add the cheese and pulse again. Finally I add the salt and pour the olive oil into the handy dripping gizmo on the top, turn on the processor to low, and watch the magic happen. I transfer each batch into a large bowl and restart the assembly line until I am out of basil. Then I stir all the batches together and pop it in the refrigerator for an hour while I clean up the kitchen. I like to freeze my pesto in small portions. I find it easy to scoop if it's chilled, and scoop it out onto parchment-, wax paper-, or plastic wrap-lined trays. Count on a solid 4 hours to freeze a tray. The rest of the pesto will keep, chilled with plastic wrap on the surface, for several days. Turkey burger with goat cheese and pesto. Hey! I found your blog! Why didn't you tell me you had a blog?!! 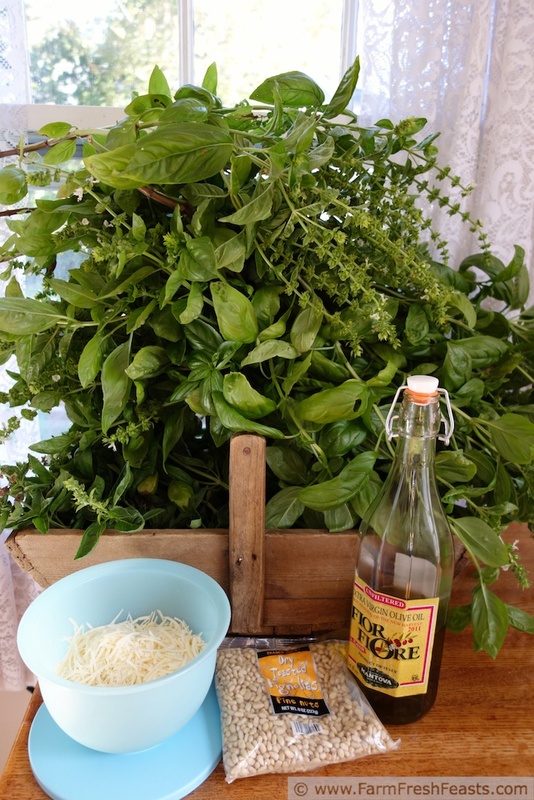 My basil is still alive because the weather here thinks it's still summer (although today is promising...) If you can tell me how to keep my psychotic squirrels out of my garden, I may try to grow some veggies next year! If you were on FB you'd know I had a blog. I'm just sayin'. My pup Simon is the one who keeps the squirrels and chipmunks out of my garden. The dog won't come when he's called, but if I whisper, "Simon, there's a squirrel in the garden" he's out the back door in a flash. Your pesto turns out much thicker than mine. I don't know that ours would be scoopable even if chilled first. For those that have that issue or don't want to wait to chill to scoop, I suggest freezing in ice cube trays. Once frozen, you can pop out and store in a zip top freezer bag. Excellent point! I have ice cube tray issues (though we're testing some from BB&B that may work) but for the first year here we didn't have an ice cube tray that would work. I think the olive oil thickens when cold and that helps it stay together. You're a genius with the whole cookie scooper/melon baller idea. I did mine in ice cube trays and then put all the "cubes" in one Ziploc bag. When it came time to defrost, it all defrosted together in one lump and I lost my single serving sizes. Separate bags my friend, separate bags. Did you freeze for a set period, then pop them out and stick them in bags? I tend to forget things in the freezer for longer than it takes to freeze, so they usually are REAL frozen when I stick them in a baggie. Then I only have clumping problems if SOMEONE, who will not be named, unplugs the freezer to plug in a glue gun to make a castle for school and causes partial defrosting . . . Were you checking the visual recipe index? :) Thanks!